Matt Damon, like so many Hollywood elites, is a left-wing bigot whose understanding of economics is astoundingly abysmal and yet entirely typical of his political party. Last week, at a “Save Our Schools” march in Washington DC, Damon demonstrated his paucity of economic understanding, while at the same time disclosing (once again) that he regards expletive-laden invective as the best method of argumentation. It is not, as the following article makes clear. What Damon’s superficial tirade lacked, however, was any real-world understanding of the deterioration of core curricular learning in America. Students can’t master simple division or fractions because today’s teachers — churned out through lowest common denominator grad schools and shielded from competition — have barely mastered those skills themselves. Un-educators have abandoned “drill and kill” computation for multicultural claptrap and fuzzy math, traded in grammar fundamentals for “creative spelling,” and dropped standard civics for save-the-earth propaganda. Consequence: bottom-basement U.S. student scores on global assessments over the past two decades. Blaming the tests is blaming the messenger. The liberal education establishment’s response to its abject academic failures? Run away. This is why the Save Our Schools agenda championed by Damon calls for less curricular emphasis on math and reading — and more focus on social justice, funding and “equity” issues. It’s elementary that people will work longer and harder if they know they will be rewarded. There’s nothing anti-teacher about the question. (And before teachers-unions goons go on the attack, I am the child of a public school teacher and the mother of two children in an excellent public charter school by choice.) But Damon’s hinges came undone when confronted with the mild question. Never mind that most out-of-work Americans would find nothing “sh**ty” about earning an average $53,000 annual salary plus health and retirement benefits for a 180-day work year. 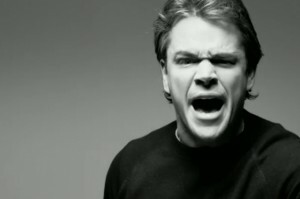 Damon went on to deride standard, mainstream behavioral economic principles as “intrinsically paternalistic” and “MBA-style thinking.” And when the young reporter’s cameraman pointed out that there are bad apples in the teaching profession as in any profession, Damon called him “sh**ty,” too. Tinseltown stars can afford to put emotion over logic, progressive fantasy over practical reality. The rest of us are stuck with the bill. And those whom bleeding-heart celebrities purport to care most about — the children — suffer the consequences of bad ideas. By contrast, as the educational documentary “Waiting for Superman” (produced by avowed liberal turned reformer Davis Guggenheim) pointed out, one out of every 57 doctors loses his or her license to practice medicine, and one out of every 97 lawyers loses their license to practice law. Public education is a failure, Matt Damon knows it because like all of hollywood’s elites, he probably sends his children to private school so that they do not have to go through the horrid public education system of this country. Also, off topic, it is perfectly fine to hate the country you choose to live in (as you claim Howard Zinn did) because individual rights gives sovereignty and autonomy to each and every individual, on the basis of being a member of the species of homosapien, over the nation-state in which they exist. As individuals, we are our own masters no matter where we choose to live. Plus, the classic sentiment of “well if you don’t like ‘Merica, you can gittt out!” just stupid and archaic. I agree that anyone can say whatever he wants about anything, but I don’t agree that it’s “perfectly fine” to hate the country in which you choose to live — or, at any rate, if you live peacefully and well and (because of property rights) you grow wealthy in that country where you choose to live, and yet you then constantly ejaculate (which I agree you are free to do) about how much you hate that same country, I too reserve the absolute right to call you exactly what you are for this absurd contradiction: a hypocrite. When these fools shoot their mouths off this way, I simply stop patronizing them.